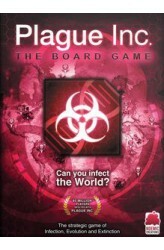 Plague Inc: The Board Game is a strategic game of infection, evolution and extinction for 1-5* people - based on the smash-hit digital game with over 85 million players. Can you infect the world? Each player is a deadly disease and they must battle against each other to spread their plagues, develop new symptoms and ultimately wipe out humanity. Starting with Patient Zero, you spread your infection across the world by placing tokens in cities - earning DNA points and preventing other players from becoming dominant. Players choose which countries are placed on the board but you must be both climate resistant and connected to a country before you can infect it. Eventually, as countries become fully infected - you try to kill them using the Death Dice. &nb..